Highest quality stereo analogue audio up to 384kHz/32bit available on your PC, Mac, Linux computer, iPad or Android tablet. The hiFace DAC includes all necessary features to be the perfect DAC for all kind of hi-fi systems: asynchronous data transfer mode on USB 2.0, compliancy to USB 2.0 Audio Class (no drivers needed for MacOS, IOS, Linux and Android), very low phase noise oscillators and last-generation conversion IC capable of 384kHz and 24 bits. Windows users will enjoy it in Direct Sound, Kernel Streaming, WASAPI and ASIO (depending on the OS version), while Mac users will be able to take advantage from Integer mode and Direct mode. While the hiFace DAC output is purposely designed to give its best with amplifiers and pre-amplifiers line level inputs, it may also be used to drive medium and high impedance headphones. Most audio interfaces and USB-provided DACs refer the data stream clock to the same USB interface clock, that often suffers a very heavy jitter (short range oscillator frequency variations). Thanks to two quartz precision oscillators used on M2Tech hiFace DAC, clock source for internal interface to the conversion IC features a very low jitter. Low jitter produces a very limited sound image distortion and degradation. Phase noise (main responsible for jitter) is also very low: this guarantees a short and long range clock stability, also reinforced by a board supply voltage regulation (e.g. at environmental temperature stability is 2-5ppm approximately, compared to 50-100ppm performed by oscillators normally used on commercial CD players). No need for custom driver. Using the hiFace DAC is very easy. Just connect it to your Mac, iPad or Linux computer and it will be immediately visible in the devices list and ready to use. A driver is still necessary for Windows computers, which enables for DS, KS, WASAPI and ASIO mode. 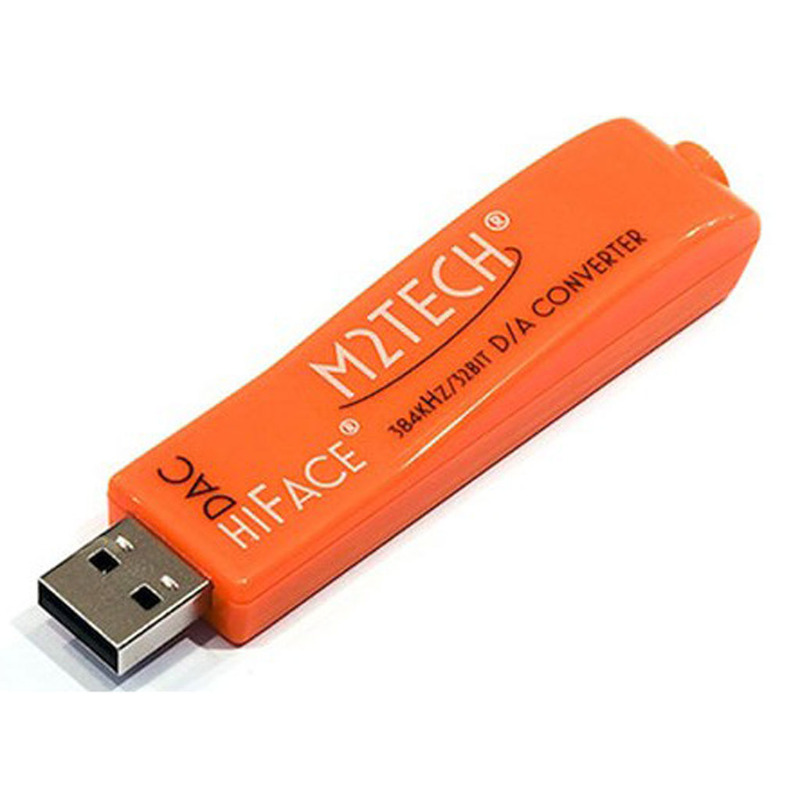 M2Tech hiFace DAC features a very compact size and can be directly (or using an accessory USB A-A adapter, not supplied with hiFace) connected to a High Speed USB 2.0 port of any computer or tablet. A 3.5mm stereo jack socket provides an output stereo line-level signal, ready to be connected to a Hi-End system. No external power supply is required, as hiFace DAC draws its power from USB bus itself and regulates it with its internal regulators. hiFace DAC connected to a last generation mini PC provided with a High Speed USB port makes for a complete digital music source at very low prices (in the range of few hundreds Euros). Such system allows for listening any density and resolution music files (up to 384/32! ), playing own CD's using a CD ROM drive, obtaining access to more than 10,000 web radio, many of which broadcast their transmissions with CD quality.